Over Spring Break, my husband and I took our three boys to the zoo, where we happily chased peacocks around and marveled at the length of the giraffes’ tongues as we fed them from paper cups. Sure enough, as they were each given a fish, they ran to separate corners and promptly masticated their food, smacking loudly, pieces of fish flying, eyes darting around. The zookeeper continued, “We have to remove the mom otter for a private feeding, otherwise her sons would take all the food.” And I’m sure, I thought to myself, all her sanity as well. Somehow this all seemed vaguely familiar. With three growing boys, I have an ever-increasing grocery bill, and my name to them is not “Mom,” but rather, “Mom, can I have something to eat?” After dinner, there is typically a requested second round of dinner followed by a denied request for a third round of dinner and subsequent claims of starvation. Rather than a zookeeper doling out fish, I’m more like a lion-tamer in the ring, constantly fending off hungry tummies. At the zoo that day, I was a bit jealous of the mom otter, removed from fish-smackers for a peaceful meal. It’s difficult sometimes for me to understand my boys’ level of need for food. When the kitchen’s cleaned and closed for the evening, their constant demands can be frustrating. But in the end, I am their mother, and although I don’t fully understand their needs, I want to meet them, because I love my sons. The fact of the matter is that I am no different from my sons. My needs are just as compulsive — for acceptance, for love, for purpose, for rest, for help — but I have lost the childlike instinct to simply ask my Father for my needs to be met by him. When my sons have a need, they immediately come to me. When I have a need, I veer toward shame, frustration, and guilt. My boys aren’t above otter-like begging, but I have somehow grown accustomed to muting my needs through attempted self-sufficiency, or berating myself over having needs at all. I am easily frustrated by my own frailty and weakness, believing I suppose that neediness is akin to sinfulness. In fact, neediness is the necessary first step toward relating with and enjoying God, because neediness leads to dependence. God’s names, in turn, give us new names. He changes who we are. We are no longer orphans seeking our belonging; we are the Adopted. We are no longer thirsty; we are the Forever-Satisfied. We are no longer condemned; we are the Approved. We are no longer helpless and hopeless; we are the Helped. 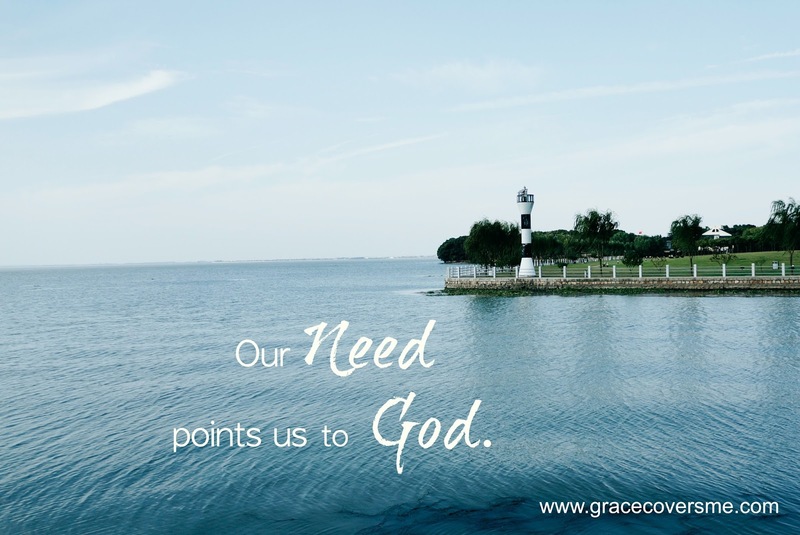 The best part about the nature of our God is that he doesn’t begrudge our need. As a mother who loves her children imperfectly, I long to give my children everything I can possibly give them. As a Father who loves perfectly, he gives us exactly what we need in exactly the right way. Better yet, he understands our need, having walked in our human shoes of physical limits and emotional and relational pain. In the face of our great need, the only option for us is to become like a hungry growing boy — or perhaps an otter begging for its fish. Rather than focus on the needs or think ourselves silly for having them, we must let our hunger pains point to the Need Meeter. When we approach him, our Christ is no lion-tamer, pushing us away in our weariness and hunger and thirst. He instead says, “Come to me, all who labor and are heavy laden, and I will give you rest” (Matthew 11:28). He says, “Blessed are those who hunger and thirst for righteousness, for they shall be satisfied” (Matthew 5:6). He receives us with gladness, because he is the very one we need.